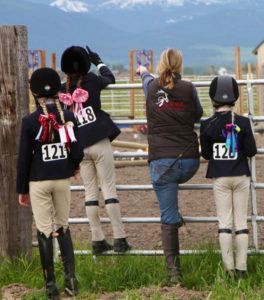 Montana Hunter Jumper Association Safety First! Basic Safety You Should Know and Understand! 1. Tie your horse with a Quick Release Knot. Always tie your horse with a quick release knot in case your horse spooks, pulls back, or you need to quickly move the horse. This way, with a simple tug on the end of the rope, the knot is undone and your horse is not in danger of hurting itself or you! If you do not know how to tie such a knot, have a knowledgeable person show you how, and practice until you can do it yourself! 2. Wear appropriate boots and clothing. Your average horse weighs around 1100-1200 pounds and most wear iron shoes. Always wear boots in case you get stepped on-while they may not mean to hurt you, getting stepped on in sandals, bare feet, or tennis shoes could mean spending awhile in a cast! It is also wise to wear long pants, especially when riding in case you pass through trees, branches, or brush that might cut you. It will also keep the bugs away. And always wear gloves when longing your horse-even the most laid back horse will occasionally kick up it’s heals on the lounge line. Gloves will save your hands from getting rope burned. 3. 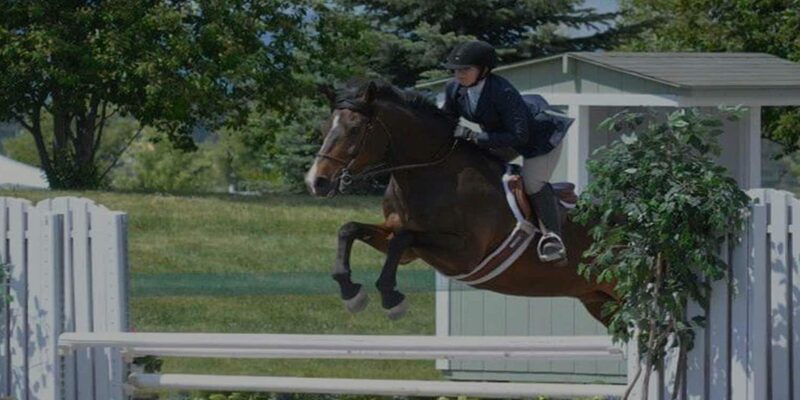 Always run your stirrups up when dismounted. Many accidents can be avoided by running your stirrups up the leathers when you are not mounted. Horses can catch loose stirrups on things while walking by, or even get their mouth caught in a hanging stirrup when biting at a fly. 4. Check your tack every time you ride. Even tack that is cleaned and oiled regularly will require repair and replacement over time. Make it a practice to check all your tack before you ride. Check for cracked leather that could break, particularly on stirrup leathers, bridles, girths. A broken girth or stirrup leather could cause a bad fall, and a broken bridle could mean losing all control of your mount! 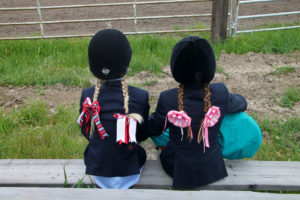 Check for tears and loose or frayed stitching and broken buckles, or a broken tree in the saddle. Also be sure to check for proper fit, as horses tend to change shape as they are in training, which can affect how your saddle fits. As saddles get older, the stuffing can pack down and change the fit of the saddle as well. Poorly fitted tack can cause painful problems with your horse so if you are not sure if it’s correct, find someone to help you who knows what they’re doing. 5. Lead your horse from the left side with both hands on the lead rope.Coil the lead rope in your left hand in a figure 8 coil, in case your horse bolts so your hand won’t be caught in the lead rope. With your right hand grasp the lead about 3 inches from where it snaps into the halter. This will give you the maximum control over your horse. NEVER let your horse trail behind you on a loose lead-if it spooks it can run you over. If you have trouble controlling your horse with a regular lead, have someone knowledgeable show you how to use a stud chain. It is very important that you always have control of your horse. 6. Don’t duck under your horse’s neck. Instead, to get to the other side, walk as closely behind it as possible, and talk to it so it knows you’re there. This way, if it kicks at you, it will more likely just nudge you out of the way. The more space you leave between you and your horse when walking behind is more room for him to land a hard kick, so be extremely careful. Or walk far enough away from its hind legs that it can’t possibly reach you if it were to kick. 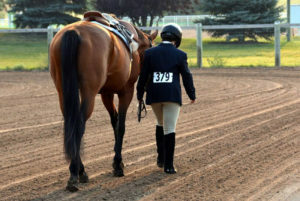 Walking in front of a tied horse is just as dangerous, leaving you vulnerable to being struck by a front foot or giving you no place to go if your horse pulls back or spooks. 7. Use common sense. Many things can and will go wrong if you spend time with horses. Keep you and your horse safe by using common sense. Think how your actions could affect your horse, if there is a chance it could cause a problem, don’t do it! Many bad wrecks can be avoided if you use a little extra caution and think things through.